Grab your kilts and whiskey, because now is the perfect time to binge watch Outlander! OK, you don't have to drink whiskey or speak with a Scottish accent, but according to the cast of the Starz series, it is the perfect time to binge their show and we agree. The most important reason to do so—besides the fact that season four premieres next month—is to celebrate the fact that Outlander is a finalist for E! People's Choice Awards Bingeworthy Show of 2018. Over the weekend, E! News caught up with the cast of the time-traveling, romantic drama series and they were thrilled to talk about their show and why voters should make them the Bingeworthy Show of 2018 winner at next month's PCAs. "Amazing," Caitriona Balfe who plays Claire Randall told E! News at New York Comic Con on Saturday when talking about being a PCAs finalist. "Who has the best fans?" she asked the camera before the rest of her cast mates yelled, "We do!" Balfe's handsome love interest, Sam Heughan who plays Scotsman Jamie Fraser on the drama quickly jumped in saying, "Binge, binge, binge as much as you can and remember to vote for us for the E! People's Choice Most Bingeworthy Show!" If Jamie, err, we mean Heughan says you should vote, do you really think you should mess with him? Ya, we didn't think so! "I think we are the most binge-worthy," Balfe said before Heughan echoed her sentiments adding, "I think we are the most bingeworthy." "Ya, we give you lots and lots of episodes," the Irish actress continued and she's not lying. With three seasons to catch up on before the new season premieres in November, there's really no excuse as to why you're not catching up right now. It's not like you have to time travel to revel in the love story that is Claire and Jamie! Richard Rankin, who plays Roger Wakefield on the show knows what's important too, which is why he told E! News, "I binge on it. I'm voting." 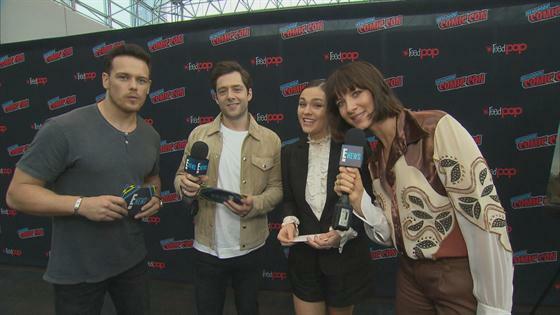 Balfe and Heughan's on-screen daughter Sophie Skelton AKA Brianna Randall Fraser also jumped on the Outlander hype train noting, "It's the perfect time to binge before season four." The cast of Outlander wants you to binge their show, and of course cast your vote for them to win PCAs Bingeworthy Show of 2018, as you take your deep dive into the Scotland-based series ASAP. "So, binge every day and vote every day too!" Heughan concluded and when the Scottish dreamboat talks, we listen! Voting for all of the People's Choice Awards categories ends on Friday, Oct. 19, so now is the time to make your voice heard...and catch up on the epic drama show in the process. PS: Season four of Outlander premieres on Sunday, Nov.4 at 8 p.m. on Starz.